Adding in weights as part of your regular workout routine is crucial to being a better ultimate player. In addition to doing power movements like squats and deadlifts, it’s important to add in some balancing work and small muscle work. Part of that small muscle work deals with wrist and grip strength. In the gym, you will be able to push and pull more weight by having a stronger grip and wrist and you will therefore see more benefits from your workouts. On the field, you will have more consistent throws since you will get more snap on your throws and you will catch more discs since you will have stronger fingers. You can also look at holding your grip in Flex position and in an Extended Position (pronating and supinating the wrist) so you can take this into considering when thinking about working on your grip strength. The majority of people have a strength imbalance between their dominant and non dominant hand as well so this will help you work towards correcting that. Elaine Huba, master personal trainer and competitive powerlifter, will take us through a series of exercises that we can easily incorporate into our workouts to help us improve our grip and wrist strength. We don’t have to do all of them; however, we should be doing some of them for each of the 3 types of grip strength. There will be suggestions for each video so you can get an idea of how many reps/sets you should be doing to get maximum benefit from each exercise. Elaine Huba, master personal trainer and competitive powerlifter, explains what grip and wrist strength is all about. One way to improve your grip strength is to simply grip the bar during your workouts, which will engage your wrists, forearms and shoulders and will help improve your grip strength. Some people let the bar hang loosely on their hands so just ensure that you grip the bar. When you are doing deadlifts, there are 3 ways to grip the bar: underhand, switch and hook thumb. Start with underhand, use switch when you can no longer lift the weights without your hands slipping off the bar and finally use hook thumb when your hands slip off the bar in switch grip. A great way to work on improving your pinching grip is to pinch 2 plates together and do curls or shoulder raises while pinching the plates. Start off with low weights and work your way up. You can do 3-5 sets of 10-15 reps and your goal should be close to failing on reps 13-15, so aim for enough weight to challenge yourself. An exercise you can do to work on your crushing grip is to hold a bar at shoulder height and simple rotate your wrist side to side. The less imbalanced you hold the bar (the closer to the end you have your hand) the more of a challenge it will be. If you find holding a stick to be too easy, you can use a light weight barbell (start with 10 pounds and work your way up). You can do 3-5 sets of 10-15 reps and you should be close to failing on reps 12-15 so try to have an appropriate weight that will challenge you. This is an exercise that I used to do in junior/senior high school when I was playing hockey to build up strength in my wrist and forearm. It’s really easy to make and you can easily do it at home. I would do 5-10 full sets and you want to go slow both on the way up and way down. This is a great exercise to work on your Extension grip and you can easily do this with a thick elastic band (we like the thick elastic band that comes on broccoli usually). You can do 3-5 sets of 20-30 reps and make sure you go slow and controlled and aim for full extension and closed fingers on the contraction. This exercise might not look like much but it’s much harder than it looks. Give it a try! One of the most basic exercises you can do in the gym with plates is the Farmer’s Walk. Try to find plates that don’t have handles and are as flat as possible so really challenge your pinch grip. Try to walk controlled and don’t rush it – it’s not about speed but rather about distance traveled. Let your arms fully extend so you are not lifting the plates but rather letting them hang as your walk which will really challenge your pinch grip. Aim for 5 sets and in each set, walk as far as you can until your grip fails and the plates fall. One simple way to challenge your grip strength is to use a fat bar instead of a regular bar during your workout (think during deadlifts). 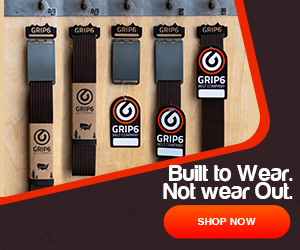 If you can’t find a far bar, you can use Fat Gripz (http://www.fatgripz.ca) and put them onto a regular bar. This will help increase your grip strength by increasing the size of the bar which increases muscle activation in your forearms, fingers and upper arms. To improve the duration of your grip strength, you can simply hang on a bar until your grip gives out. Try to hang on as thick of a surface as possible which will further challenge your grip. Do this 5-10 times and rest in between each set. Time yourself and try to improve your time each time. 1. Jam hands down deep – fingers spread wide. Jam hands down fast and hard. Get down as far as you can go and grab and squeeze hard. Bring hands up and out of rice and repeat. Go as fast as you can go (keep rice in the can). 2. Jam hands down and rotate wrists – at the bottom grab and make a fist. Move fists forward and back for 10 seconds. Move fists up and down for 10 seconds. Move fists in a circle inward for 10 seconds. Move fists in a circle outward for 10 seconds. Repeat cycle until time runs out. 3. Grab rice on top – hands on top of rice. Fingers spread wide, quick as you can grab a handful. Quick as you can open and close fingers and hand, grab hard, like your career depends on it. 4. Grab with thumbs – your whole hand will make the grab but dig with your thumbs. Concentrate – this works best with your hands on top of the rice. Dig with those thumbs! 5. Flick your fingers out – fingers and thumb together down in the rice about 2 or 3 inches. Flick (extend) your fingers out and in as quick as you can! 6. Straight finger pinch – fingers spread out over top of rice. Without curling your fingers pinch the rice. Bring your fingers and thumb together quick as you can and then extend them back out. Repeat as fast as you can. 7. Handfuls – grab handfuls of rice and squeeze as hard as you can making the rice pop out, repeat as fast as you can until time runs out. 8. Finish by grabbing handfuls of rice and squeeze as hard as you can until time runs out. An exercise I really like is to do kettlebell curls with a lighter kettlebell since you will be trying to keep your wrist straight and not bend it as you curl the kettlebell. Aim for 3-5 sets and 10-15 reps, where you will be close to failing on reps 12-15. Start with a low weight and work your way up since this will be putting stress on your wrist. Incorporating grip and wrist work will help improve your workouts and your game, but make sure that you are consistent with this work. You can do all of these in a gym but if you want to do some of these at home, get creative with the exercises. Elaine's passion for strength development began with her experience in the Olympic Oval where she gained sport-specific training theory under the direction of Olympic level strength and conditioning coaches. In conjunction with current research at the University of Calgary's Human Performance Lab, Elaine successfully adapts training protocols and techniques designed for athletes into her own, as well as her clients', training programs, regardless of fitness level. Hello, What would you say is the best exercise specifically for catching. Currently, I do closed grips while I lift/bench but my bar hangs are tiring because my shoulders are still weak to pull my whole body up. Also, a friend recommended Kettle-bell swings but I do them with dumbbells as I don’t have kettle-bells in my gym. What are your thoughts on this? The best exercises (for you) would depend on your current strengths and weaknesses. It is difficult to determine without an assessment and compete review of your training history. The exercises you are currently doing are good ones when they are incorporated into a complete program. Using dumbbells instead of kettlebells works well as long as you can maintain a stable grip on the edges of the weight. From what you describe, it sounds like some shoulder stabilization exercises and rotator work would be helpful. Some great exercises include YWL’s and rotator exercises using a Physio band. To help you transition to a full pull-up, lat pull downs and assisted pull-ups on a gym machine or using a large band on the pull-up bar are great! Onearm rows and cage pulls are also good ones. Of course, always check with your health care provider is these suggestions are suitable for you!